I wanted to take a peek at What Color Is The Wind? because I'm always looking for additional motivation to get outside with the kids and make new discoveries. This book boasts nature lovin' activities for every season of the year. It is divided up into four main sections (Autumn, Winter, Spring and Summer, dontcha know!) and has a handful of ideas per season. For example, in Autumn, Bieber suggests you collect leaves of different colors, smash them up and rub them into moist little squishy, slight powdery things and see if you can draw with them. If you use a red leaf, will you make red marks on a page, etc.? Jump in leaves. Note the different sizes of the leaves and all of the many varied types which flutter to the ground during this beautiful and colorful season. Can you hear them fall? Stop and listen. Find out! Now, some of his suggestions might be common sense. Certainly certain people will find this book more useful than others. (I, for instance, would have never thought to use food coloring on snowballs to make different sorts of statues.) 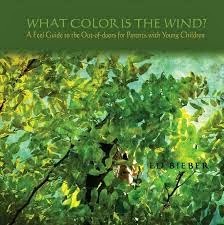 Ed Bieber wrote this book to motivate and encourage parents and care takers to get outside with their kids and to have fun. This is not a book about hiking a remote trial up a mountain or anything like that. Rather, Bieber just wants to get people outside their front doors and into their backyards or local parks. He laments that kids today spend so much time indoors working on school projects or playing video games and believes in the healing power of nature. If you are a Christian I'm sure your eyebrows raised just a tinge with my last sentence. Let me say that Bieber is not a Christian and does not express a belief in a Creator. He is more into the idea of being in 'harmony with nature' than I am. However, the difference in our worldview does not mean that I cannot learn something from him. His suggestions are practical and I do agree with him that playing outside is infinitely healthier (mentally, physically and spiritually) than being indoors all of the time. Our Creator created a gorgeous world for us to explore and be in charge of and it's good to know more about it and be involved in its life. "My goal isn't to turn you or your children into naturalists, ecologists, bird watchers or experts of any kind - although there wouldn't be anything wrong with that! I want to leave you and your child gentle into your own nature place/backyard, there to experience the joy of being and doing things together. ~ Ed Bieber"
I think that is a high and lofty goal and I'm glad he pursues it! This book is not the extent of Ed Bieber's passion for getting people into the outdoors. He also owns and operates The Nature Place Day Camp out of New York. It's a bit far for us to get to, but it looks like tons of fun. The reality is that a passionate person can motivate people to do things that they never expected they'd do, and I think that's one of the reasons why I really appreciate this book. He encouraged me (again! and I need constant encouragement!) to get outside and ENJOY it! I received a copy of this book from Wellons Communications in order to facilitate this review. I received no additional compensation and all opinions expressed are 100% my own . . . just like usual. BONUS! I have one copy to giveaway to one of you! Would you care to win? Simply leave a comment below including a valid e-mail address. This contest is open to U.S. Residents only and runs through Wednesday, November 6th. I DO need constant encouragement to get outside, though. This sounds right up my alley! I do believe in the healing power of CREATION, God has provided us with many resources for healing and pleasure. The closer to the earth the better!